The construction below will help you to answer question 12 on problem sheet 1 for the course Geometry of Complex Numbers. With your mouse you will be able to move the point labelled "Z" around the circle. Use the points below to answer the questions. 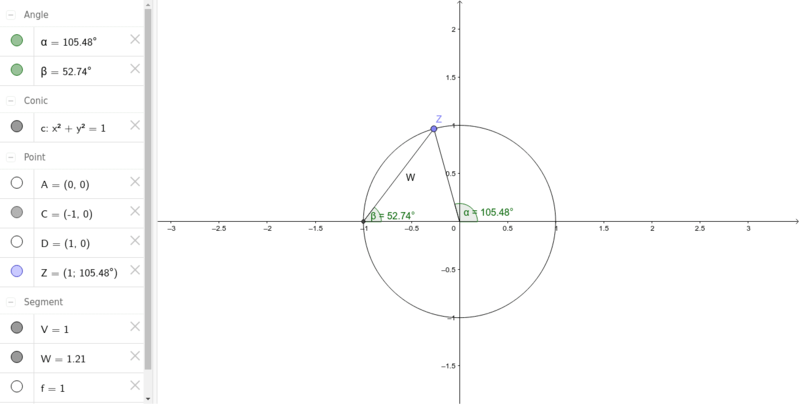 * The magnitude of z is set to 1 and therefore the point z is forced to stay on the circle indicated. * In that case what complex number does the line "W" represent? * How are the arguments (i.e. the angle) of Z and W related to each other? Can you define the relationship precisely? * If you know the answer to the last part can you state what the argument of W squared is? * Can you now answer the problem posed by question 12?